Richard Fry talks to Paul Levy about why her prefers to perform and theatre-make alone, about verse, and about his five star reviewed show, The Ballad of the Unbeatable Hearts. George Dillon is celebrating the 21st anniversary of his solo debut, and in what will be his fifteenth year in Edinburgh since he first performed on the Fringe as a student in 1982, George Dillon will be performing six five-starred solo shows for two performances each in various venues across the city. It’s a fine way to celebrate and here he discusses his work with FringeReview’s Paul Levy. Full details of Dillon’s shows can be found here. Spun Glass Theatre bring their new production of “Ink” to the Edinburgh Fringe. Here. Vivienne Egan talks to writer and director, Laura Lexx, and performer, Pete Byrom about the piece. We chat to John Diamond about the vision for this emerging venue which he visions are growing and become a unique part of the future Fringe scene. Brian Mitchell and Joseph Mitchell are a dynamic writing duo, with their acclaimed Those Magnificent Men playing at the Edinburgh Fringe in the safe hands of New Perspectives Theatre Company. Brian discusses the role of the writer and the background to the play. Co-creators of the winner of a FringeReview Outstanding Theatre Award, Tina Kronis and Richard Alger of Theatre Movement Bazaar, discuss the five-starred Anton’s Uncles with Paul Levy. Here we dive into their creative process and even get a sneak peek at their note books that informed this excellent homage to Chekhov’s Uncle Vanya. In this interview Asher Treleaven and Gypsy Wood talk about this unique blend of stand-up comedy and strip. The show, Comic Strip, generates its own special atmosphere at the Assembly Gardens and here we gain fascinating insight into the show and how it succeeds so well. Joe Bone and Whitebone Productions have achieved critical acclaim with Banes 1, 2 aqnd 3. Bane is Joe’s own creation, a one-person show based on Bruce Bane, a dark hero on the streets of a mean city. Here Joe chats to Paul Levy about bringing Bane to life three times…and beyond. Back again at the Fringe, Roy Hutchins talks of his ongoing and long-term collaboration with poet Heathcote Williams, and of his performance of Zanzibar Cats at the Edinburgh Fringe 2011. Thom Tuck Goes Straight to DVD is a solo outing for one of the acclaimed The Penny Dreadfuls, a comedy sketch group who have been hits of the comedy scene, the Fringe as well as BBC Radio. Here Thom talks about his new show and why the Dreadfuls are all going solo this year at the Edinburgh Fringe. The Diaries of Adam and Eve is about the world’s first couple and the essence of relationships. In this coversation, Rebecca Vaughan talks about the joys of working with other actors after a working alone in I, Elizabeth and Austen’s Women, and both actors (from Dyad Productions) discuss the process of devising, collaborating and evolving a production under the direction of Guy Masterson. White Room Theatre’s Bite Size Plays have been regulars at the Fringe for quite a few years now. In this interview, director and producer talks about the Big Bite Size Breakfast and the process of choosing and directing short plays. Here he provides valuable insight into the specific challenges of theatre making with ten minute pieces. Magicians Do Exist pays homage to Jacques Tati and also the role of the clown in us all. Chris Cresswell performs this one-person theatre piece and talks about clowning, comedy, audiences and the dynamic between scripted and emergent theatre. Tim Hawkins and the Remarkable Arts team are back with a bigger programme and a new venue to add to Hill Street, namely, St George’s West. How do you bring a venue into being and full life at the Fringe? In a fascinating chat, Tim reveals all. Neil Broughton is bringing “Beside the Greenside” to life, a quirky open arts space next to the Greenside Venue. One resident of the space throughout the Fringe will be Sally Boon who invites us to take “Tea with Queenie” in an intriguing site-specific theatre piece. In this interview, they both discuss their creativity and their work at the Fringe. Matt Magee brings The Voodoo Revue to the Fringe in 2011. Here he talks more broadly about cabaret and the exciting approach at the Voodoo Rooms, a growing venue on the Edinburgh Fringe scene. Greenside describes itself as the “true spirit of the Fringe”. Here venue creators and managers Darren Neale and Tara Kilbourne share their vision for the venue and the ethos that underpins its “community” spirit. Greenside has a bigger and higher profile than ever this year, and Paul Levy from FringeReview looked under the lid of this unique space. In Caruso and the Monkey House Trial, Ignacio Jarquin portrays an icon and also reveals parallels between a fascinating period in our modern history and contemporary events. Here he discusses how he steps into the skin of an icon and the artistic collaboration with acclaimed Prodigal Theatre. Full booking details, as well as times and venue info for the show are here. 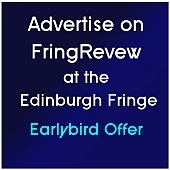 You are currently browsing the archives for the Edinburgh Fringe 2011 category.